This photo of Tom clearly depicts our quiet, contemplative, uncomplicated lives, relatively free of stress. Tom always jokes that he never imagined that his retirement would include walking other the necessary steps from his comfy chair to the bathroom, the kitchen, the bedroom and the yard. Yes, he was quite the handyman, fixing and fussing as needed, walking about the house. We never took a walk together in our neighborhood. As I began planning our worldwide travels over a year ago I budgeted for rental cars for most locations fearing that Tom would seldom want to walk to nearby restaurants, shops and pubs. 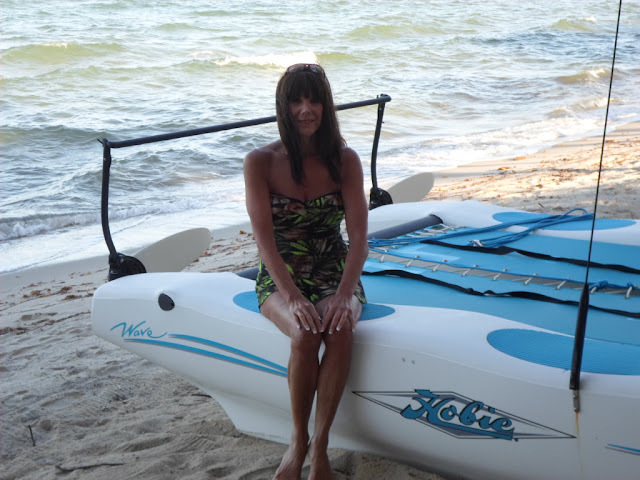 Living in Belize for an extended period, the cost of a rental car or even a golf cart was prohibitive. 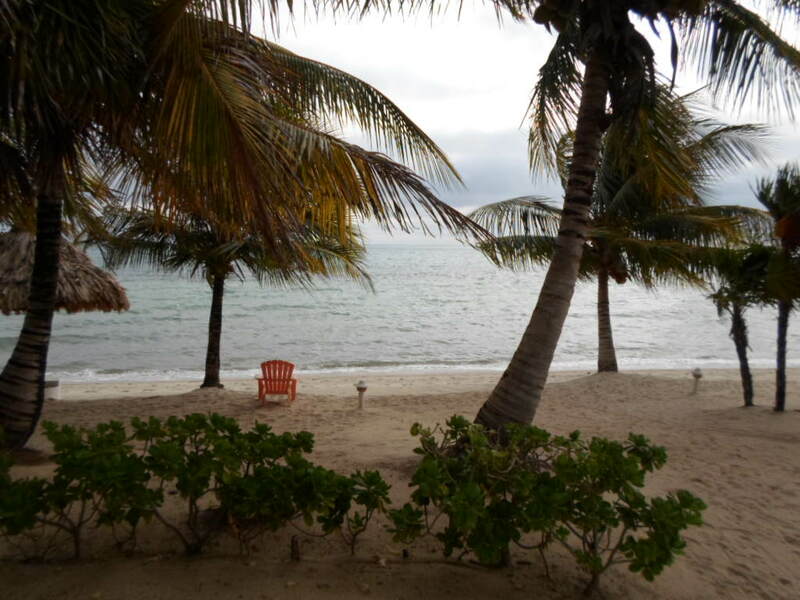 After all, we are on the secluded peninsula of Placencia, a four hour drive from Belize City where our ship arrived. Upon arriving, we resigned ourselves to occasionally renting a golf cart as needed. Much to our liking, we now have our own cab driver Estevan, whom I've mentioned here, who will take us anywhere we'd like to go for reasonable rates during daylight hours leaving us to "hoof it" for dinners out at night. With multiple good restaurants nearby requiring no more than a 10 minute walk each way, our transportation needs are fulfilled. We dine out two or three times a week and love rotating our favorites especially on the nights they offer their stupendous buffets. If we go on an adventure, transportation is provided. So, we walk. Tom walks. 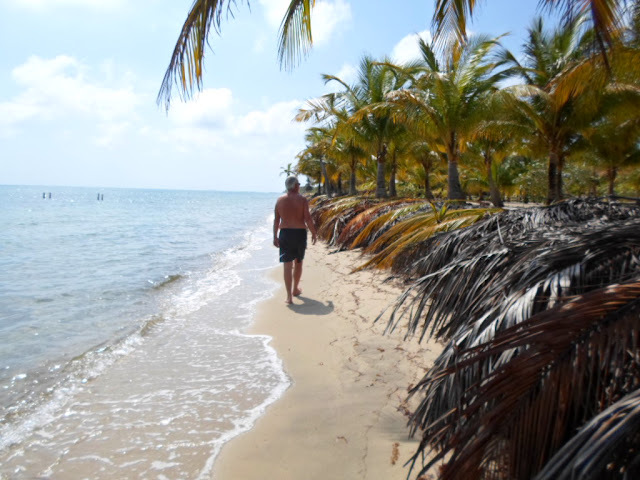 After moving to Laru Beya on February 5th with a massive expanse of white sand beach in front of our villa, Tom surprised me when within a few days of arriving he suggested we walk the beach, a popular tourist outing. I always treasured walking in our old neighborhood with our precious little dogs to their favorite spot, Poop Park, often walking with our equally wonderful neighbors and their little dogs. As long as the temperature was above 10 degrees we walked. The pads of their little feet would quickly freeze in lower temperatures. Often, our World Wide Willie would stop dead in his tracks looking up at me with sorrowful eyes that asked me to carry him home when he'd had enough and of course, I did. In the snow, on the ice, I carried him home, all 22 pounds of him, often as much as a 1/2 mile. I loved walking. Tom, not so much, having never walked the neighborhood with me once in 22 years. Each day we began to walk along the beach at a lofty pace, in the water or on the sand, carefully watching for stray rocks, shells and bits of glass, engaged in idle chatter or in quiet contemplation. We can change, can't we? Life circumstances often unplanned, force us to look at our often rigid ways leaving us open to change, to grow and to learn. Some take advantage of the opportunity, others do not. We revel in watching each other depart from that which we knew as familiar and comfortable, to the new people we are fast becoming. The chairs here aren't comfy, the kitchen supplies are limited, finding foods for our way of eating is challenging, not owning cars is peculiar and no Walgreen's is daunting. But we change to accept the differences, growing and learning in the process, all the while reveling in our personal ability to adapt. As I over-packed for almost a year in Minnesota all the things that "I couldn't live without" much of which is now packed to be shipped to my sister in Los Angeles when we get to Miami on April 13th, I realized that I too could let go of things, learning to live without the comfortable and the familiar. All the kind and generous advice others gave us regarding our excess luggage could only have meaning to us when we discovered it on our own, in our own time, on our own terms. We've changed. We'll continue to change. Suddenly, we look at one another with new eyes, with a new interest, knowing that wherever we may be we'll learn new ways of life, we'll release old ways that don't work in a new environment and, without a doubt, we'll walk, we'll walk and we'll walk. This old Johnny Mathis song wound through my brain last night as we watched the moon progress from the afternoon into dark. Yes, I know. That song sure dates me! The moon at 9:00 pm. Moonlight seems to appeal to everyone, young or old, as we marvel at the wonder of space, our world, the moon and the sun. As I sit here on the veranda, the sun in my eyes, my laptop monitor hard to see on yet another hot sunny morning, I prepare to post the photos we took last night. Back in Minnesota, on a full moon night whether on a warm summer's eve or in the brisk cold of winter, we always stepped outside on those nights to languish in the bright beam of light cast upon the lake, even when frozen, reflecting a magical feeling of awe and surprise. 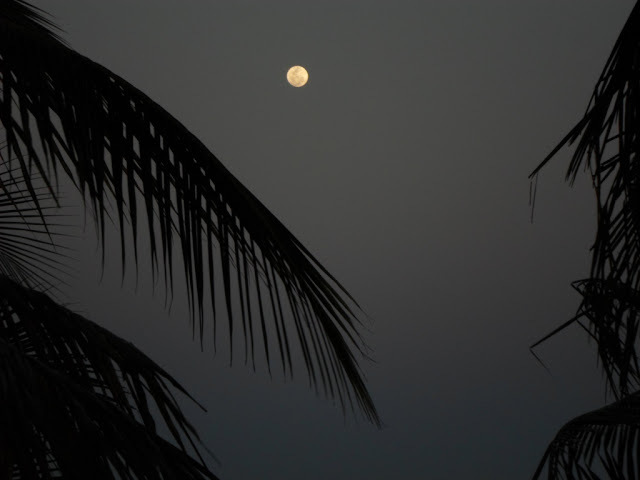 The moon from our veranda. 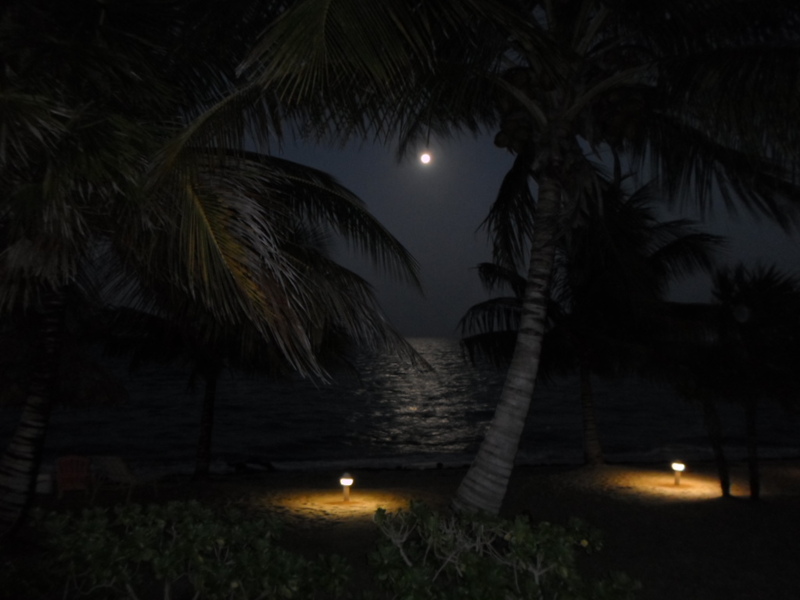 Here in another land, we find that we all share in the romantic commonality of reveling in the moon's beacon of light reflecting so graciously upon the sea. Last night was no exception, as we noticed our few neighbors also on their verandas necks stretched to the heavens. Thank you, moon. Thank you, sun. Thank you, God, for making our world and it heavens only but a glimpse of what is yet to come. 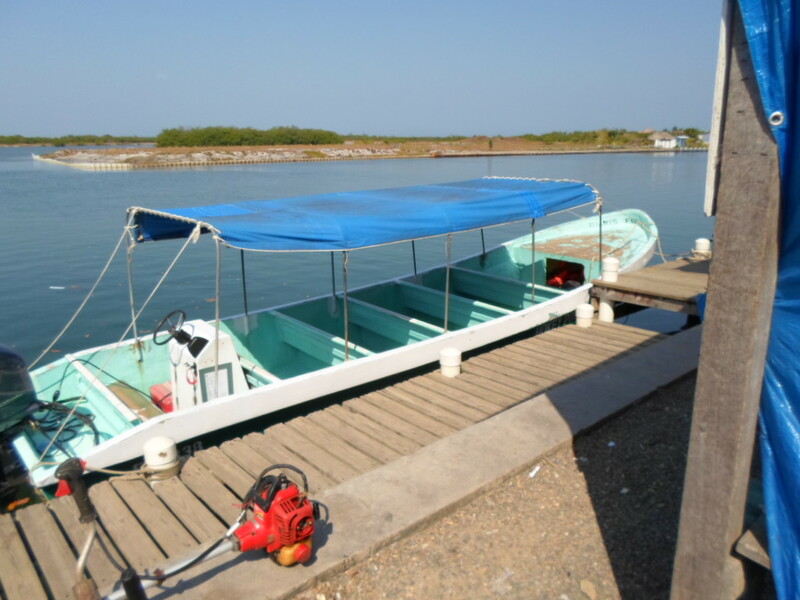 We rode on one of two identical boat across the lagoon to Mango Creek on the Hokey Pokey Water Taxi. The hut where we waited to board the Hokey Pokey boat. Only two and a half months ago while living in Scottsdale Arizona, preparing for our upcoming travels, Tom had to have his final dreaded colonoscopy and endoscopy. As it turned out we ended up having a wonderful time, meeting the gastroenterologist in his office for not only great news on Tom's results but a bird's eye view of his wide array of photos he'd taken while on safari in Africa. While admiring the quality of his photos, a lively conversation ensued that we'll both remember for a long time to come....an otherwise unpleasant experience resulting in a memorable day. 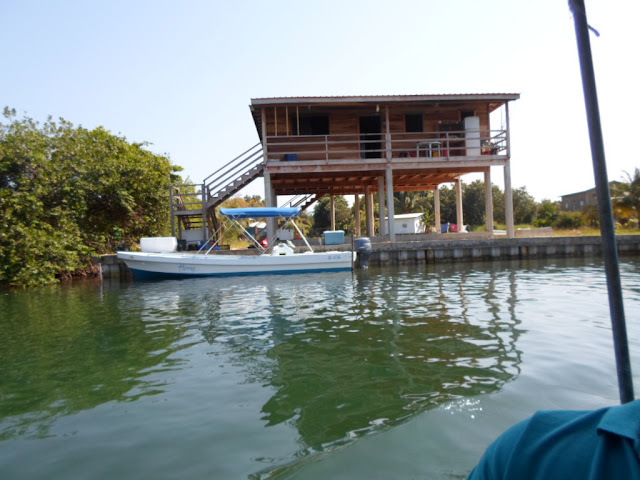 While driving through the channel to the lagoon, we saw several of these houses on stilts, a common style in Belize with potential hurricanes and high tides. His work inspired us to learn to take good photos along the way, a gift to ourselves and others who share in our passion of the treasures Mother Nature has bestowed upon us all, not only in exotic locales but in our everyday lives. Today, was a venture out into our new everyday life...taking care of business. 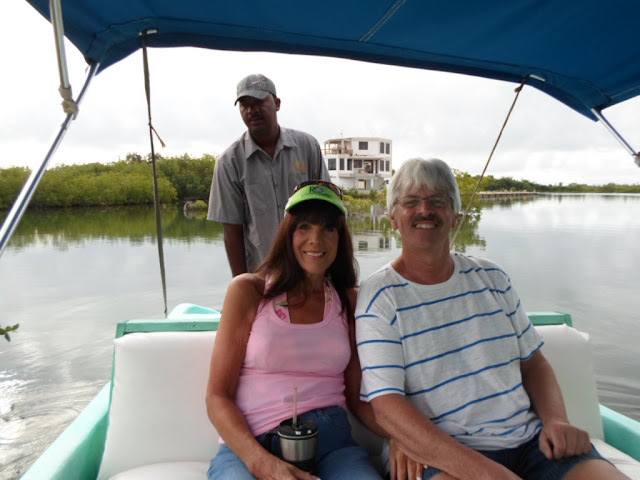 Little camera in hand, our cab driver Estevan appeared at our door, promptly at 9:30 as planned to drive us the five miles to Placencia Village to the dock on the lagoon to the Hokey Pokey Water Taxi. Estevan, what a guy! Concerned that we might not get a knowledgeable cab driver, he started making phone calls, first to his wife to get the phone number for a cabbie he knows. "Vic" who works the Mango Creek pier was more than willing to take us on the 10 minutes drive to Big Creek where the Immigration Department is located. Minutes later, he was talking to Vic, not only negotiating an equitable fare for us in advance, a mere $10 (US) round trip, but also asking that Vic would wait for us while we were in the Immigration office obtaining our 30 day extensions. Wow! Need I say that we were appreciative and impressed? Dropping us off at the tiny waiting area for the Hokey Pokey Water Taxi, Estevan suggested we met up in front of the local grocery store, The Ming at 1:30 so we could shop and perhaps find more available items. A perfect plan. With Estevan's phone number neatly tucked into my shorts pocket, we bought two one way tickets US $6 for the boat ride to Mango Creek. Scheduled to depart at 10:00 am, we waited patiently sitting on the wood benches in the shaded hut while more passengers purchased tickets. It was hot and humid. We'd frozen two water bottles for the journey, later grateful for having done so. As required we had our passports, ID, money and potentially required documents that we listed in yesterday's post directly from the Belize Immigration office. Based on comments from both locals and travelers, the likelihood of being asked for additional documentation was low. In our usual "be prepared just in case" way, brought along everything they asked for in their forms. It'd be a shame to go all that way and expense to be asked for a document we didn't have in our possession. (When in line at Immigration, we observed that some others also had the myriad documents on hand). No, we weren't asked for the additional documents. In a month, when we return for the second extension, we'll bring along the same package we prepared for today, just in case that we're the one out of a hundred that is asked, we'll be prepared. Seventeen passengers were seated in the small boat with us which zoomed across the water with ease with its huge newer looking outboard motor humming along. With such a load, the boat was low in the water. 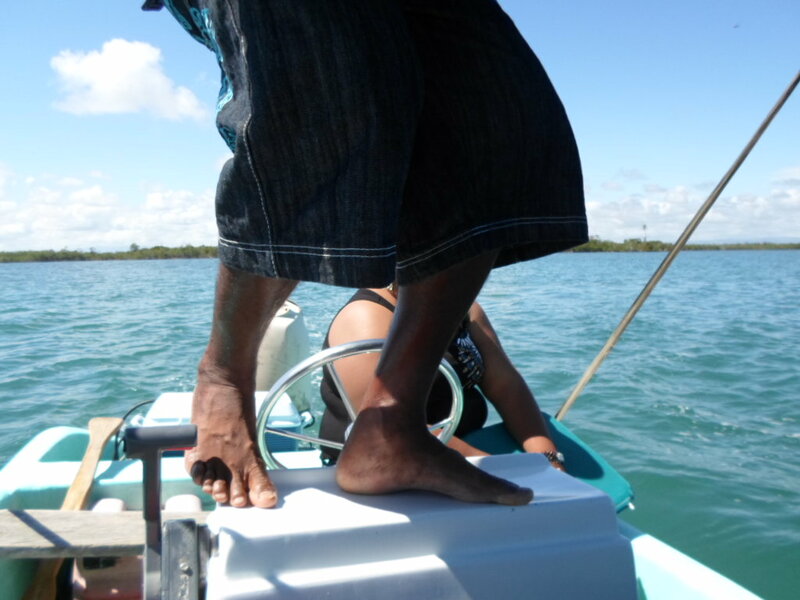 We weren't concerned as we enjoyed the cool breeze thumping across the massive lagoon to Mango Creek. Claus, Margaret, Jess and Fred, our newly met Visa Day companions. 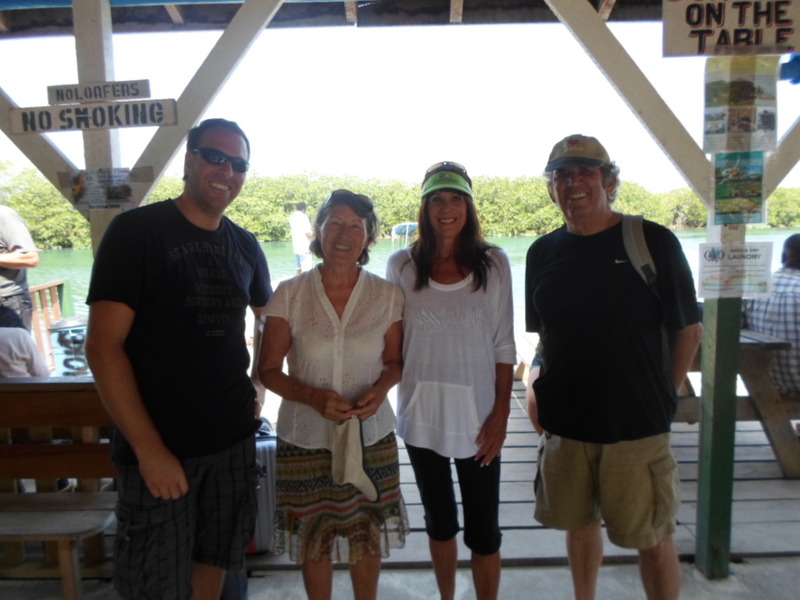 The conversation with Margaret and Fred was enhanced by the four of us meeting yet another passenger, Claus from Germany, who recently moved to Placencia with his wife and young child. 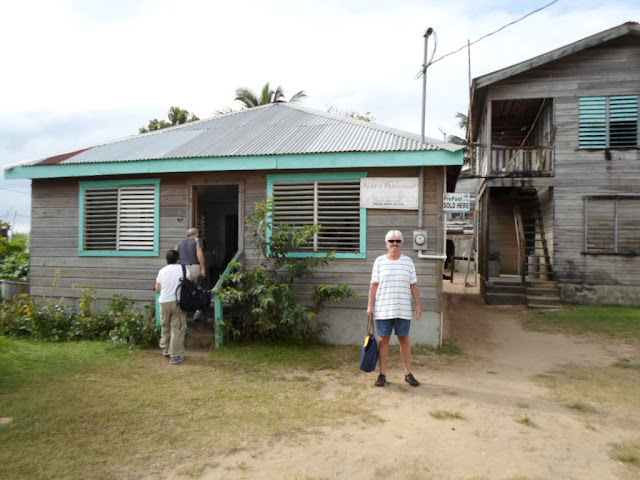 They all asked if they could ride in our prearranged cab, Vic's large van, for the ensuing trip through Mango Creek and onward to Big Creek, the location of the Immigration Department. Arriving at the dock in Mango Creek around 10:15 am, Vic was looking for us. Estevan, thank you!!! Quickly agreeing to take the five of us, we were on the road for the 10 minute drive to Big Creek. The conversation among the five of us made the time fly by not only along the ride to and fro but the 25 minutes total it took for the five of us to get our passports stamped. ﻿﻿We made it back to the pier in Mango Creek at 11:05 and thank goodness, the return boat had yet to depart. Waving goodbye to our newly found "friends", Tom and I took off on foot from the pier to walk along the busy main road of the village to for a stop at a local vegetable stand, to a bank to exchange US $100 money to Belizian money (Belize $1.98 for US $1.00) to eventually end up at The Ming grocery to hook up with Estevan for the ride back to Laru Beya, our temporary home. The stop at the vegetable stand was more fulfilling than I could imagine. With no marked prices on any of the fresh organic produce we loaded up all we could carry and use over the next 9 days until Estevan returns to take us grocery shopping again. Imagine, we purchased all of these items for a total of $12! Fresh, organic, Roundup free, vegetables in the natural colors intended by nature, not chemically induced to be darker and brighter. Fresh produce!! We couldn't have been more thrilled. As we've discovered, with only occasional carrots, cabbage, onions and peppers in most grocery stores, our selection has been limited. 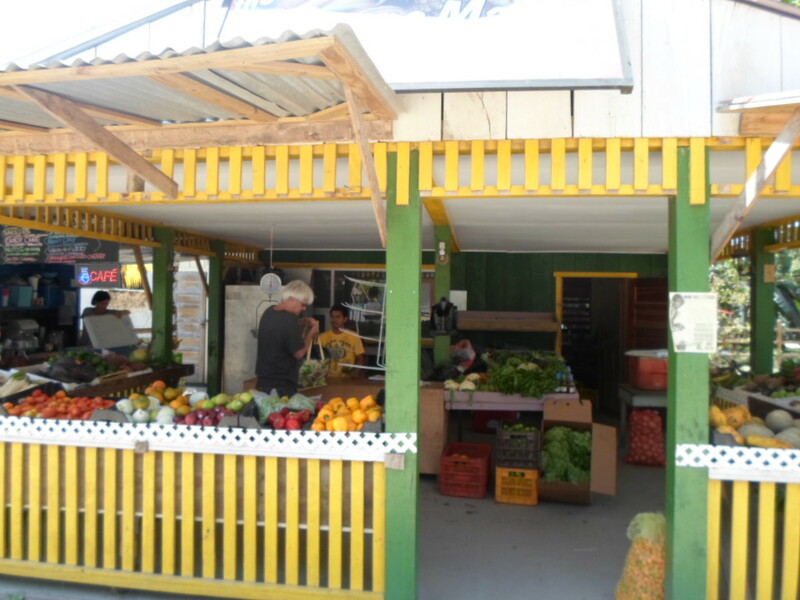 Without wheels and the cost of a cab into Placencia at $20 plus tip, we'd decided it greatly added to our otherwise ample grocery store budget of $800 a month (dining out adds another $700 a month). Thus, we've limited ourselves to canned vegetables and homemade home chopped coleslaw which we now have made as a staple in our diet. With lettuce at the vegetable stand, we looked at each other wondering if we wanted lettuce salad, shaking our heads "no". We decided to stick with our standby coleslaw using our homemade dressing. I make it early in the day, to ensure its ice cold by dinner. In the future, we'll go shopping in the village which has a much wider selection than the few stores we've frequented in the past. On the return trip, Estevan offered to take us to the village going forward for $15 round trip enabling us to select from a wider range of foods. We purchased enough food today at a cost of $190 to get us through until a week from Wednesday when Estevan returns. Of course, we gave him an ample tip, appreciative for all that he did for us. Back in our villa, we put the food away, content with our purchases and locked up our documents in our built-in safe. I began preparing dinner for tonight, a fresh batch of coleslaw, a giant bowl of chicken salad using the leftover chicken from last night along with big plate of buttery steamed green beans. We'll go back on the Hokey Pokey by March 20th to extend our visa for the remaining 20 days until we sail away on April 9th. Now, for our much anticipated vegetable laden dinner, a sense of satisfaction for another great day and an evening with a full moon. Humm...maybe we'll get a few good shots tonight! Check back tomorrow to see! Hokey Pokey Captain (we think). 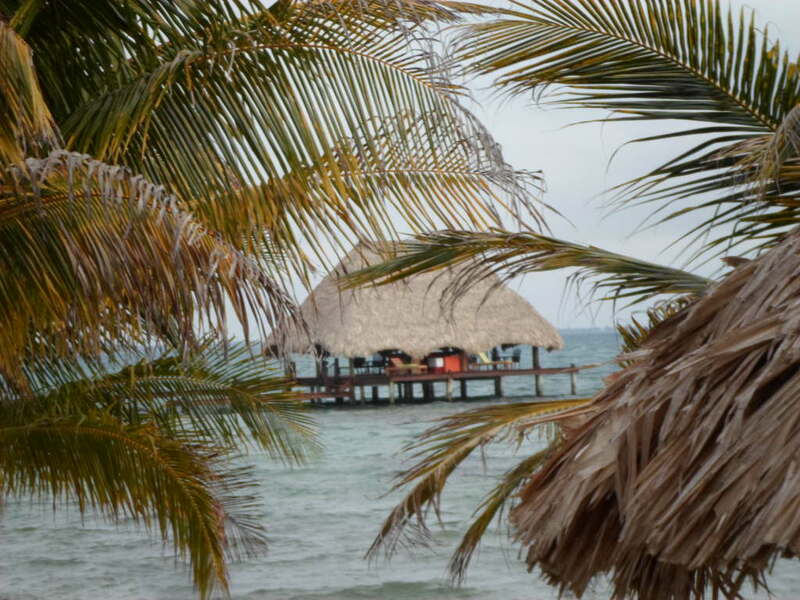 While still in Minnesota, we researched the possibility of getting our visas for Belize based on our extended stay of two and a half months. As indicated in the post regarding disembarking in Belize City on January 29, 2013, the immigration officer that boarded our ship would only provide us with a 30 day visa, ending on February 28, 2013. 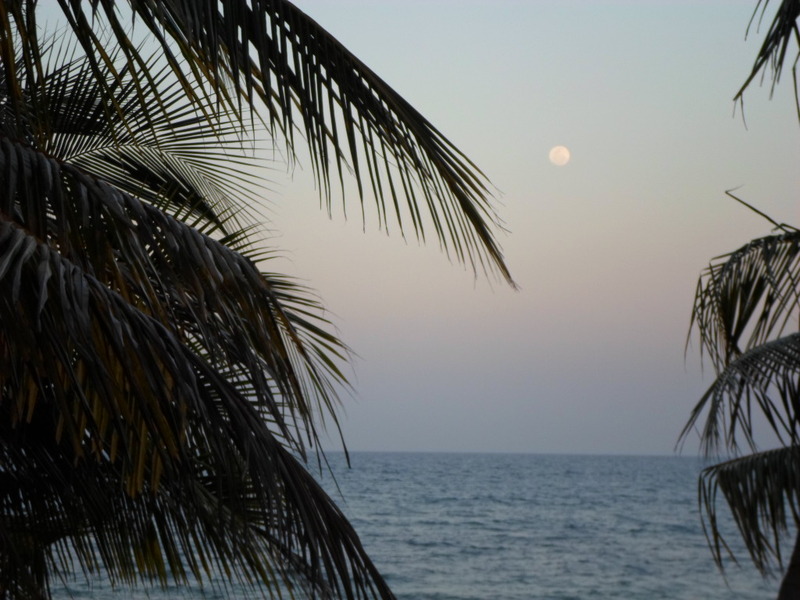 In Belize, it's only possible to get one 30 day extension per personal visit to an immigration office, resulting in the necessity of our going twice to immigration, once good until March 30th and another good until April 9th, the date we depart on our upcoming cruise out of Belize City. From what we've heard from expats, they will not make an exception for the extra 10 days and give us a visa from February 28th to April 9th. We understand the necessity of such rules applying to everyone and surely, we have no right to an exception. 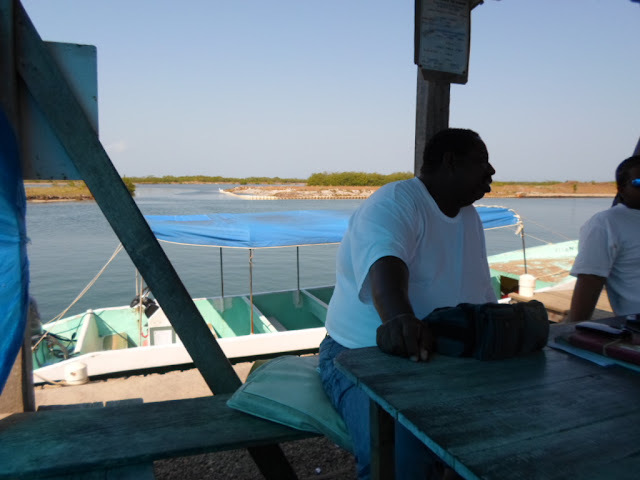 Tomorrow morning at 9:30 am, our trusty cab driver, Estevan will arrive to take us the five mile drive to the village of Placencia to the pier to hop a ride at 10:00 am on the Hokey Pokey Water Taxi to take us the relatively short distance across the lagoon from Placencia to Mango Creek/Independence, located on the mainland. The cost per person is US $3 per person each way. 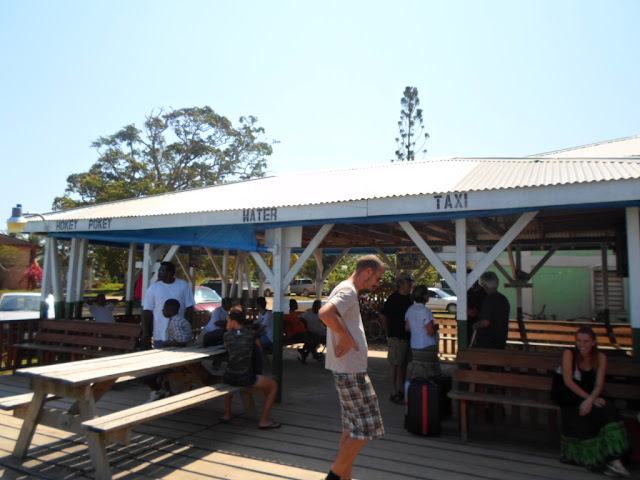 Once we arrive in Mango Creek, it will be necessary to take another taxi for a ride to the immigration office at an unknown address which apparently is too far to walk. Both Tom and I looked online for an hour for an address finally giving up looking. From comments we've read online, most taxi drivers know where it is. 6. Purpose for Trip: Educational – Letter of Introduction from University or Educational Institution Business – Letter of Introduction from Company or Organisation and supporting documents Tourism – see number 3 above. Our equally trusty Planon PrintStik, printed all of the above and we're ready to go. Providing a bank statement is a bit unnerving but, if asked (and we may not be) we'll be prepared. It would be a shame to go through this process and not have the necessary documents in one's possession. We could have applied to the immigration department in the UK. However, we are unable to send or receive mail here in Placencia in a timely fashion to ensure we'd get our passports back in time for departure. We have two US passports but, feared it would be returned long after we've left. 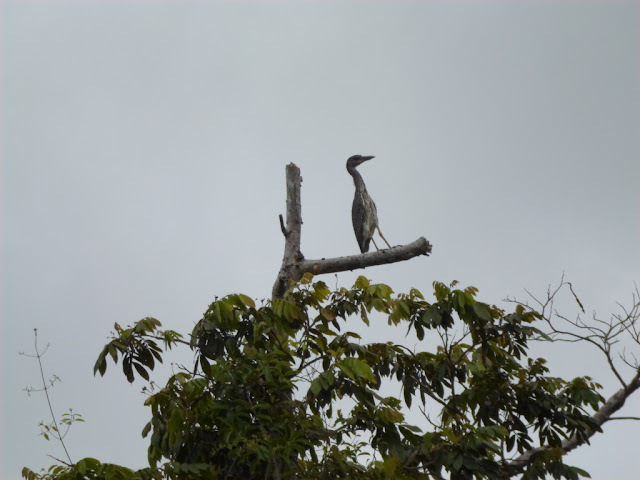 Another option was to rent a car and drive the two hour winding Hummingbird Highway to get to Belmopan, the capital city and apply in person. This surely would be a full day's outing. We opted for the trip to Mango Creek/Independence, hoping we can get done in time to return to Placencia Village on the 12:00 PM Hokey Pokey. This would give us time to have lunch in Placencia at one of the highly recommended diners, grocery shop in the larger grocery store, the fresh fish market and the vegetable stands, having Estevan pick us up when we're done around 2:30. This choice gives us an opportunity for a fun outing as opposed to a long drive up and back. It all made more sense to us. If the time at the immigration moves quickly, all could go as planned. We shall see how it goes, reporting back here tomorrow with photos and a rundown of our day. Have an enjoyable evening watching the Academy Awards! Much to our delight (mine more than Tom's) we'll be able to watch it in HD on the flat screen TV in our little villa. Oh, we're getting spoiled. Expectations will be reduced considerably after we leave this fabulous spot! Tom and I enjoyed the balmy evening, sitting on the beach in front of our villa. I've never cared for the expression, "24/7," thinking it sounded as if it were a lazy way of saying, "all the time," "around the clock," or "every minute of the day." 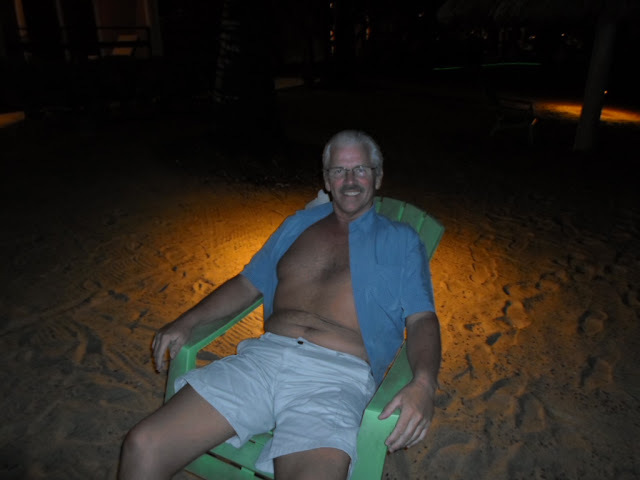 The words "24/7" never crossed my lips until a few days ago while lounging at the pool, chatting with a guest at Laru Beya, it fell out of my mouth when she asked me, "Now that you both are retired, how does it feel to be together all of the time?" Without hesitation, I blurted, "Being together 24/7 has worked well for us. We don't whine, snip or pick on each other. It works!" I let out a little gasp, shocked at myself for having said the dreadful expression. 24/7? Yep, that's us. 24/7? Yep, that's most retired people. A few hours later, while again lounging, this time in the comfy chaise on our veranda, I allowed my mind to wander to the conversation with the woman. After 22 years of being together with busy work schedules and personal lives, we're finally together. We shot this coconut tree photo in the dark on the beach in front of our veranda. How do couples make it work? Over the years we observed many couples on their way to, and eventually into retirement. Some made it work. Some didn't. Early on in our relationship and in many years to come, Tom and I surrounded ourselves with a role model couple we adored, Sue and Chip, our dear friends and neighbors four doors from us with whom we spent many enjoyable hours. Entrenched in lively conversations on countless occasions we discussed every possible topic, over fabulous food and drink, during holidays, special events, as well as on Chip and Tom's shared birthdays on December 23rd. Hold it steady, Honey. 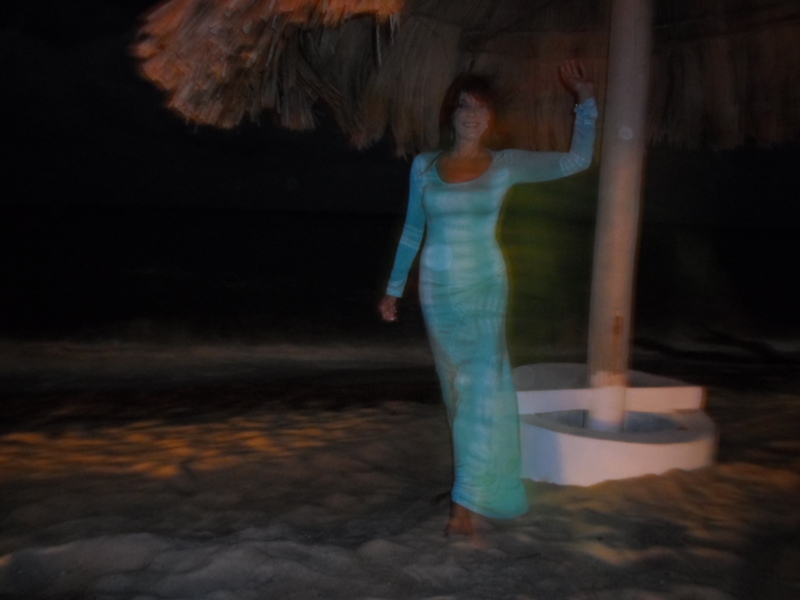 Its a little blurry! As a couple, Sue and Chip personified the ideal of retirement. Chip, retired as an orthopedic surgeon, used the finite hand skills he'd acquired as a surgeon to fulfill his artistic bent busying himself as a sculptor, artist and singer. Sue, a charming hostess and friend to many, played tennis and entertained guests, surrounding herself with meaningful social and academic adventures. 1. No nagging, no complaining, no snipping and no negative tone of voice when asking or responding to anything at all. 2. Expand on or develop new interests to fill a portion of your time in gratifying endeavors, sharing what you've learned with your spouse opening new avenues for conversation. 3. Spend time with friends and family building relationships of your own. 4. Socialize together always speaking well of one another with a twinkle in your eye. Never complain about your partner's bad habits (which seem to worsen as we age) to others, including family. 5. Share financial status with one another on an ongoing basis especially if one handles the money more than the other. 6. Discuss life's concerns in a productive manner, inspiring solutions and resolutions together as a couple. 7. Compliment each other, always seeking new ways to express your interest and attraction to many aspects of your partner, not merely complimenting their outfit for the evening (which in itself always earns brownie points!). 8. Always give one another credit for accomplishments even if only one of you did most of the work. After all, it is a partnership. This is what we learned from Sue and Chip. This is what we strive to achieve every single day. It's a choice, isn't it? It's not a matter of circumstance one falls into via good or bad luck. Do we accomplish it "24/7?" No, but like any good habit, its easier to fall back into the goodness, if one so chooses. We lost our dear Chip the end of May last year (see blog post in archives for June 1, 2012). We miss him. We'll always miss him. But, in us (and in Sue and many others who knew him and easily loved him) his legacy of love, laughter and passion for life continues on, along with the fine example of a happy and fulfilling retirement as an individual and as a couple. Last night we had fun, as we so often do, prompting our silly pictures posted on Facebook and again here in this blog today. May it serve as a reminder that this, dear friends, is what retirement means to us, not traveling the world on one adventure after another but, being together living our lives to the fullest, living in the moment, with a "twinkle in our eyes" of what is yet to come. Stormy windy day on my birthday. Repeat photo from a sunny day a few weeks ago. Yesterday morning, on the day of my 65th birthday, clouds rolled in from the white capped sea creating a gloomy blanket over us. Standing at the glass door at 6 am, I wondered if it would clear in time to spend the bulk of the day outside, as we've done over the past two weeks since arriving at Laru Beya, a virtual paradise of lush gardens, shifting sands, and non stop congeniality. As raindrops propelled by the fierce winds splayed on the glass, for a moment I allowed myself a little whine, "Goodness, can't it be nice on my birthday?" Quickly reminding myself that the "old me" might have been annoyed by an inclement day, I straightened up and threw my brain into reverse. "It's a perfect day. I'm 65 years old today, alive, healthy and living in a haven of loveliness with the man of my dreams, living a life I'd never imagined, a life I never dared to dream. Let it rain! Let it pour! It doesn't matter. No walk on the beach. No long walk next door to be driven to the outdoor Singing Sands, five miles down the road to celebrate the occasion with yet another special dinner. No one-hour by the pool soaking up our daily dose of Vitamin D, which now "they say" reduces the effects of aging. We shall see how "that's working for us!" Coffee, shower, dress for the day and tidying up our place in preparation for our Mayan maid Gloria to come in and clean at 9:00 am, the same time our trusty cab driver Estevan appears to take us grocery shopping so we'll be out of her way. She was early. We like her. Tom blurted out, "It's Jessica's birthday today!" Obviously, he was fishing for birthday wishes for me when back in the US, the wishes came in abundance on that day. Gloria throws her head back and laughs, "Its my birthday today too! Happy birthday, Miss Yessica," she says with her sweet broken English. We all laughed together. Tom and I couldn't give her enough good wishes. How ironic? I can't recall ever meeting anyone with the same birthday. Determined to find something fabulous to make for dinner, we rummaged through the three freezers at the grocery store in Seine Bight, the little town next to us, a short cab ride away. Sensitive to Estevan waiting outside, I had an awful time making a decision: frozen chicken parts, thin frozen steaks, frozen hot dogs or frozen short ribs. Hummm...what shall it be? The limitations of our diet added to feeling confused and rushed. I grabbed the chicken, parts unknown, unable to make a decision for any other nights. We grabbed the four packages of cream cheese we'd ordered a week ago, several packages of local peanuts in the shell, a head of cabbage, six giant carrots and three onions from huge bags that had just arrived from the farm. After a total of only $35 plus $10 plus tip for the cab, we were back on our way "home" still wondering what we'd cook for the birthday dinner. As we put the perishables in the ample ice cold stainless steel fridge, perusing its contents, we decided on eating the leftover homemade pizza still in the freezer while I'd make a fresh batch of coleslaw by shredding the vegetables by hand. The knife in the drawer was dull. 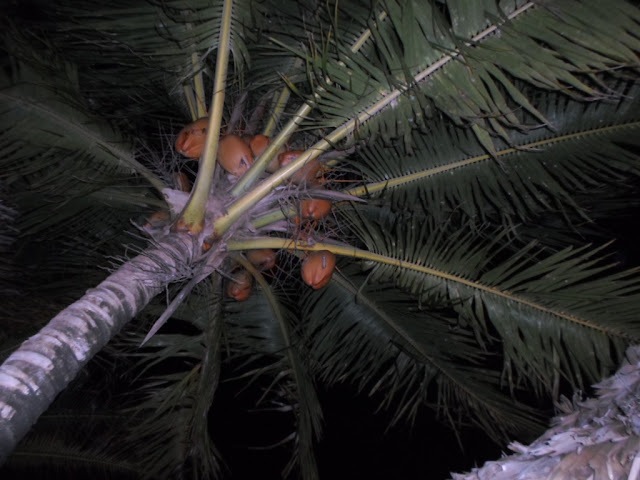 I sharpened it on the rock Tom had brought inside and washed for cracking coconuts. It worked much to my surprise. When does one "wash a rock" while living in the US?. Never. I made the coleslaw early in the day to chill. Coleslaw and pizza? Sure, why not? A perfect birthday dinner. (This was the other half of the pizza we didn't really love but ate it anyway a week ago). It tasted better the second time. The rain continued throughout the day into the evening. We'd cancelled the dinner reservation online. We stayed in all day and evening. I finished Part 2 of Monkey River for this blog, posting multiple photos (a slow laborious process in Blogger). Tom watched the stock market news on TV. I responded to a multitude of thoughtful birthday wishes posted on Facebook, spoke to family on Skype and paid bills online. You know, the stuff we do on rainy days, snowy days, days we're stuck inside. I was not disappointed. It was a good birthday. Tom did the dishes as usual. I played solitaire on my computer scoring my highest score ever. At 9:30, my head nodding into my computer, I decided to turn in. For some goofy reason I was tired. I guess that what 65 year olds do. Jason driving the boat with his feet in order to get an "eagle's eye" view of the manatees. His ability to spot wildlife is astounding! Today is my 65th birthday. 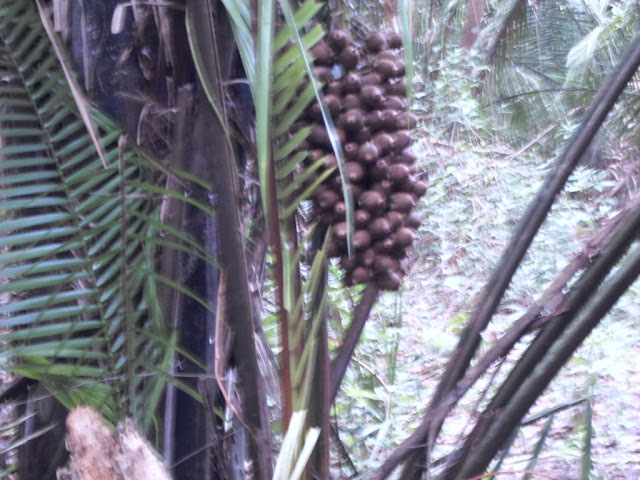 Unable to "lunch with the ladies," to receive the usual much appreciated cards and gifts from family and friends with no mail delivery available to us here, Tom gave me this gift of a day on the Monkey River and journey into the rain forest. Nothing could have meant more to me, to experience this memorable day and also to share it with all of our family, friends and readers. Today, we'll grocery shop, walk on the beach, spend time at the pool and tonight, dine in one of our favorite romantic restaurants, the Singing Sands. What a day! I qualify for Medicare (can't use it outside the US) and am having the time of my life in this amazing country. 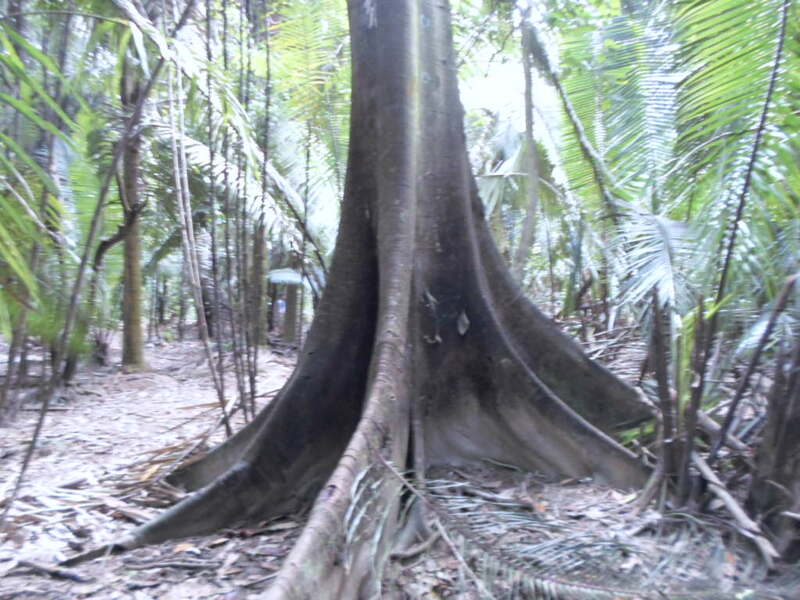 The rain forest is filled with a wealth of nature's miracles. Seeing first hand the vegetation that may be the answer to many of the world's illness added to our commitment that the rain forests must be preserved. 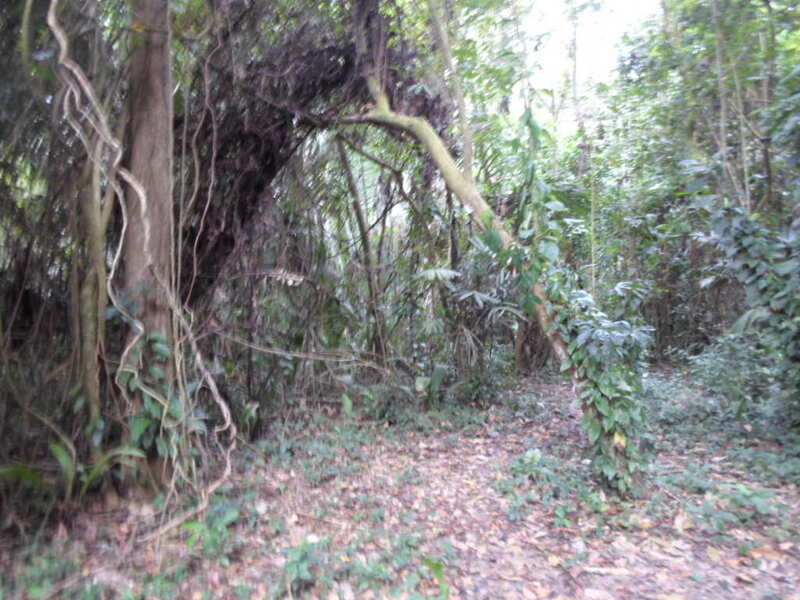 This massive untouched area gives one hope. 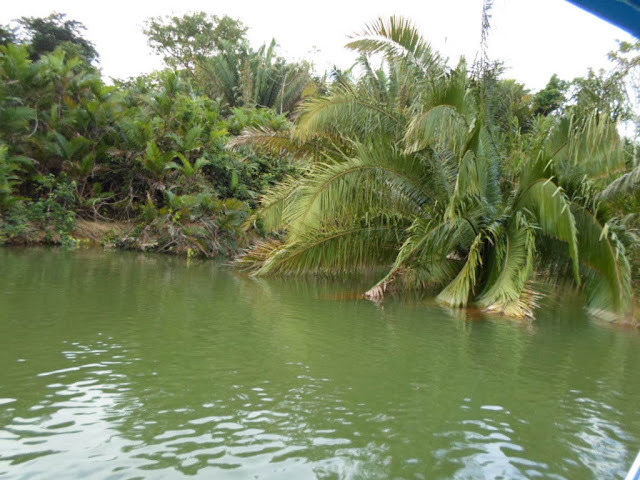 The country of Belize is dedicated to the preservation of these areas, constantly striving for ecological purity. Termite nest. They were busy at work. Unusual trees hold secrets to health. 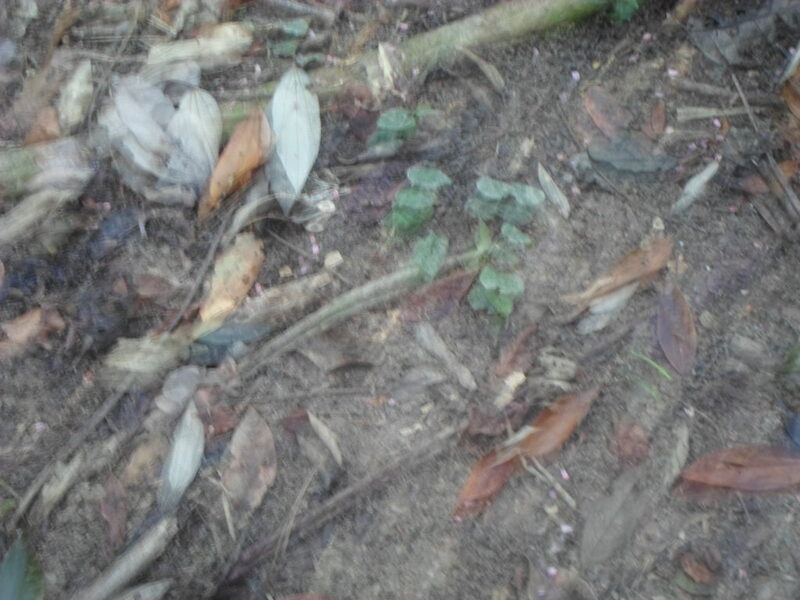 The varied rain forest floor. This was a nature of the path we walked. 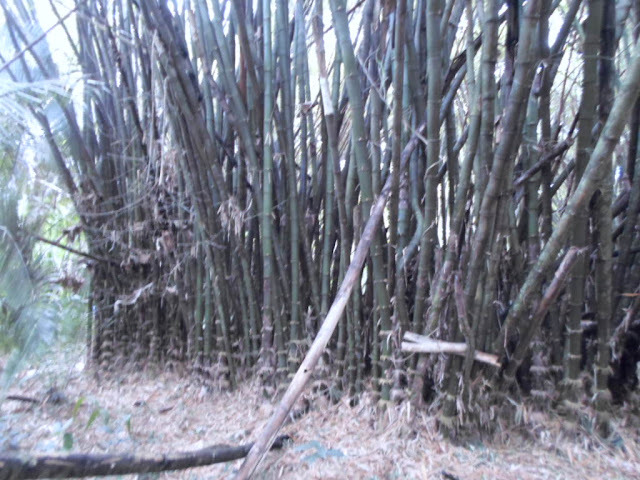 Largest bamboo growth area in Belize. 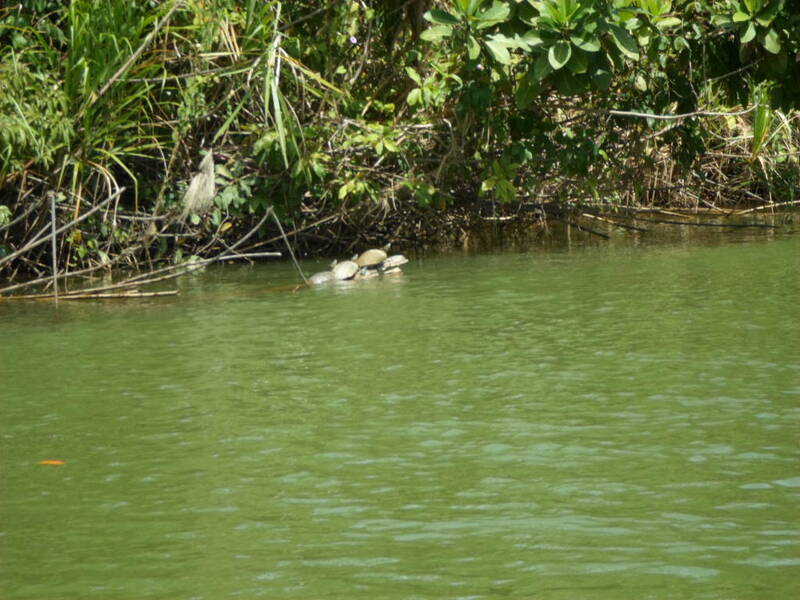 Four turtles sunning on a log. 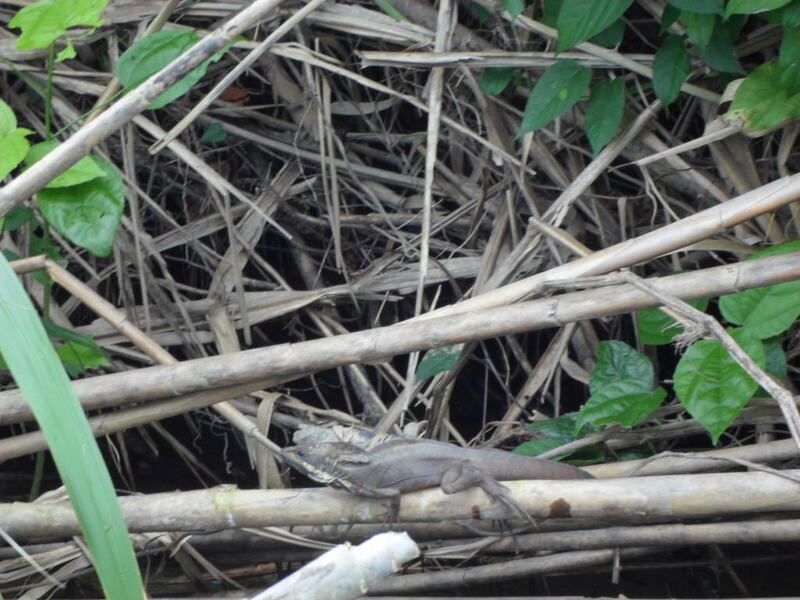 Iguanas, as do other wildlife, blend into their environment, making them difficult to spot. Croc climbing out of the river to the shore. Leaving the rain forest, we jumped back into the boat, swatted more horse flies and headed to Alice's Restaurant for our awaiting lunch. 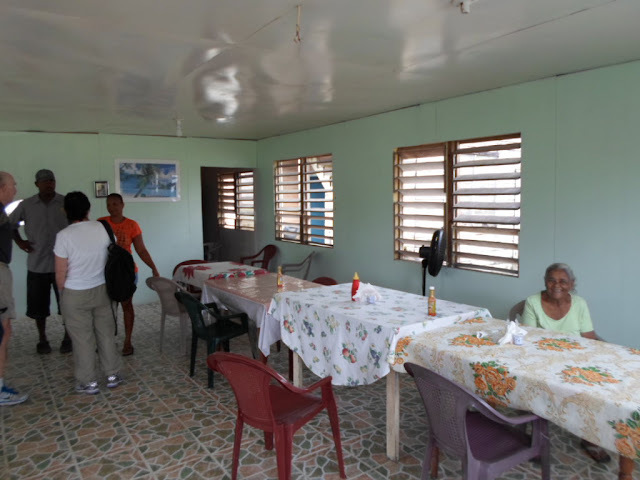 The food was hot, delicious and much welcomed along with ice cold bottled water. We engaged in lively conversation with our Ruth and Howie. Alice's Restaurant was hosted by a small group of friendly, kind and attentive staff. We weren't sure who, or if there was an Alice. Shortly after we ate lunch, Jason appeared coaxing us back to the boat for more adventure, the long fast bouncy boat road back to Placencia with multiple stops along to way to look for manatees. Excited at the prospect of seeing these massive creatures, we couldn't get back into the boat quickly enough. Much to our delight we saw several in the open water area between the mainland and the Placencia Peninsula. Elusive mammals, they place their blubbery snoots above water for only seconds to gather a gasp of air, quickly dashing back under the sea. They were nearly impossible to photograph. 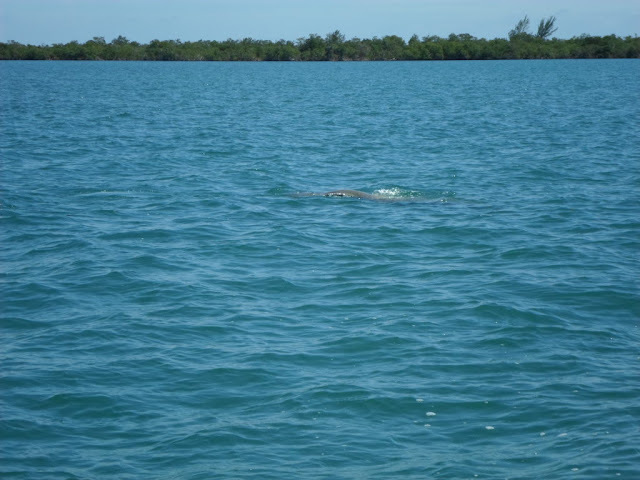 Please bear with the photos that we managed to take and see the link for more about the manatee of Belize with better photos. 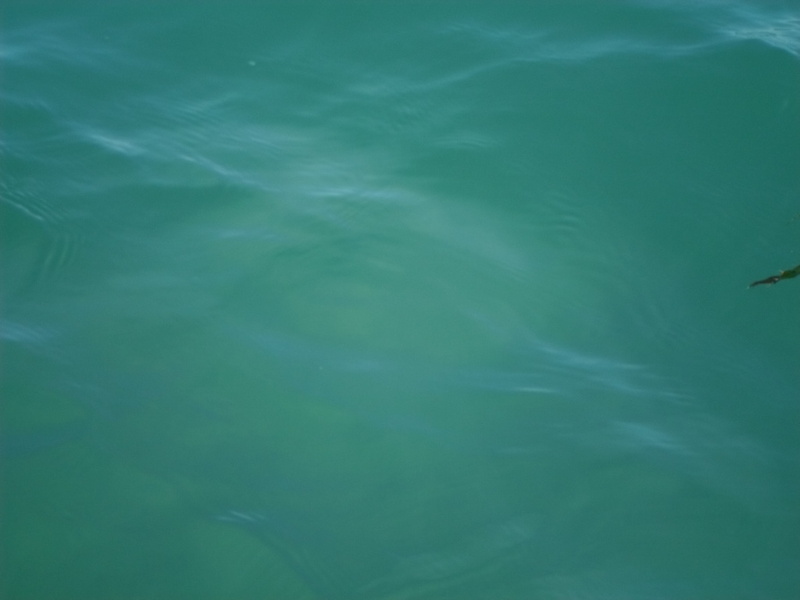 Look carefully to see the outline of the possibly 1000 pound manatee in the water. 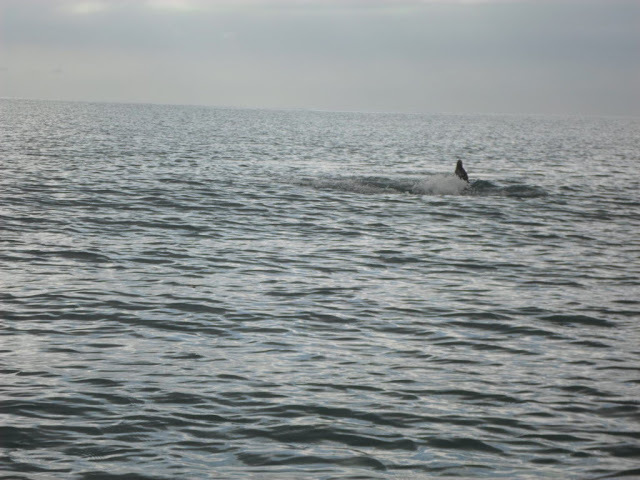 We'd hoped for better photos but, they're shy and don't do the "show" familiar to whales and dolphins. At the exact moment we shot the photo, a mother and baby surfaced for air. Returning at the lagoon at 2:00 pm as planned, covered in bug spray, bearing a wide array of bites, we felt dirty, wind blown and ready for a spray from the outdoor shower followed by a dunk in the pool. It was a perfect day. We loved every moment. For now, this is our home and our "backyard" is a treasure of gifts bestowed upon us by Mother Nature and the sea. Thank you, Mother Nature. Thank you, sea. Thank you, Jason. Thank you, Tom Lyman. And thanks to all of our readers for adding to our adventure by "sharing" it with us. Looking like tourists, off we went on our adventure this morning. Covered in bug spray, looking like tourists loaded down with a camera, binoculars, water shoes and swimsuits under our clothes, at 7:45 this morning we walked across the street to the pier at the lagoon to meet up with our well versed guide, Jason, born in the tiny community of Monkey River, an area rich in Belizean history and culture. Along the way, we met a lovely couple, Ruth and Howard from Brooklyn, New York staying here in Laru Beya over the next several days, also participants in our planned outing which was arranged through the resort. The cost per couple for the six hour expedition was $150. 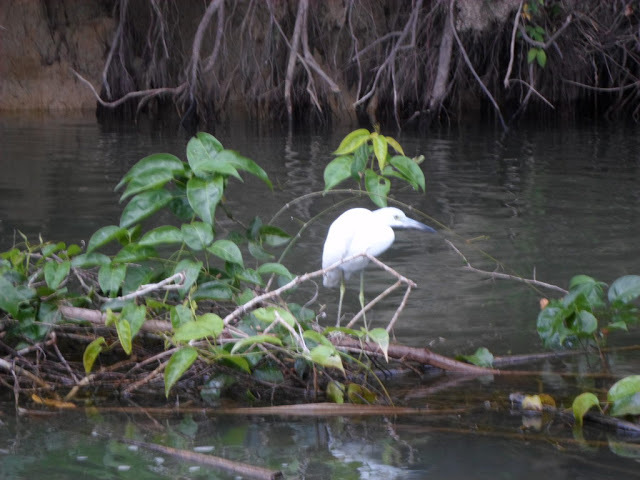 After a high speed bumpy boat ride from the Placencia peninsula across the rolling Caribbean Sea to the mainland of Belize, we made our way to the Monkey River, a well known 10 mile long winding river literally amass with wildlife and overgrown vegetation. 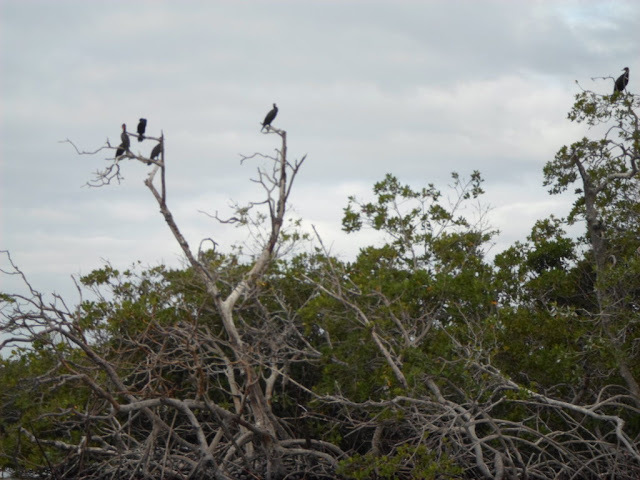 Vultures hovering in the trees along channel as we left Placencia. Tom in front of Alice's Restaurant in Monkey River where we had lunch. Inside Alice's Restaurant in Monkey River. Monkey River locals enjoying the day. 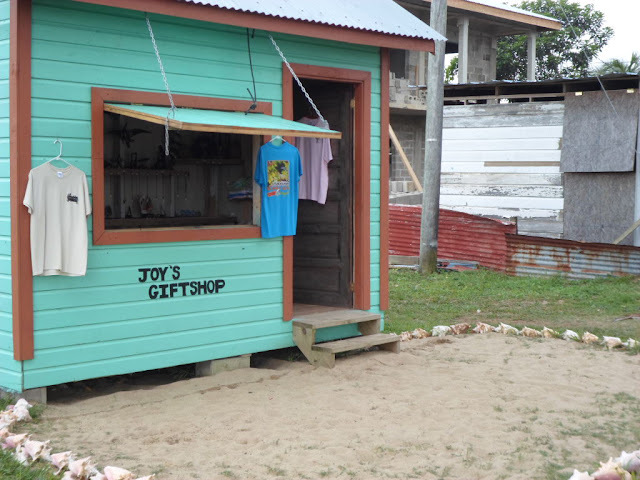 The gift shop outside Alice's Restaurant. Notice the conch shell border around the entrance. 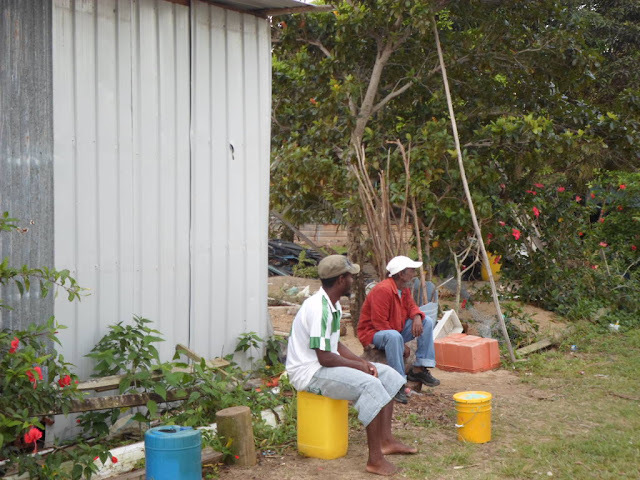 Speaking mostly a combination of English and Creole, Jason was an articulate wealth of information possessing the eye of an eagle, quickly spotting every morsel for our excited attention to behold. We saw all we could have hoped to see! 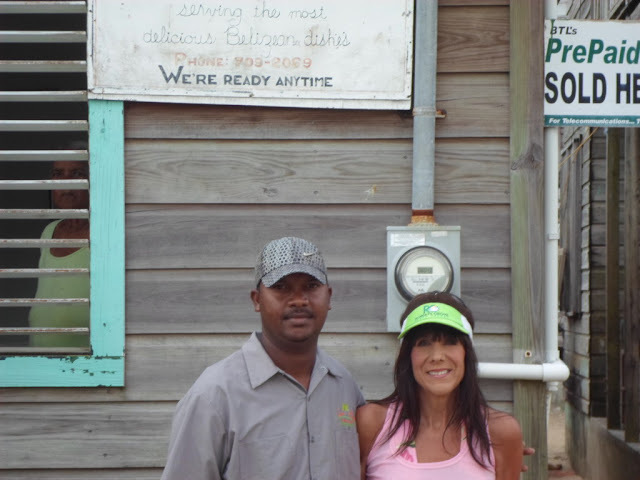 Jason, our tour guide and Jess, outside Alice's Restaurant. Luckily, the day was overcast, less humid than normal, around 80 degrees making it a perfect day for our adventure. With low expectations and a little apprehensive about the abundance of horseflies, mosquitoes and no-see-ums hovering around us in the boat, we slathered on the bug spray while bracing ourselves for what was yet to come. 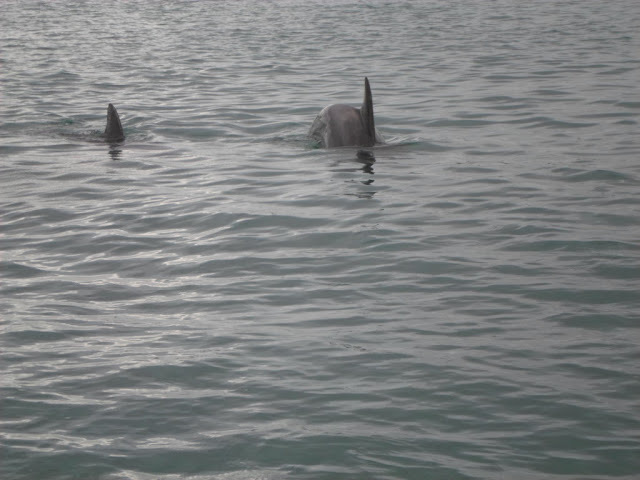 Pair of dolphins we saw on the way to Monkey River. Moments later, we saw another dolphin. Jason slowed the boat as we entered the winding river, stopping frequently to point out crocodiles, many species of birds, unusual fish, families of the Black Howler Monkey known for their loud screeching. Halfway through the four mile river journey, Jason pulled the old fiberglass boat up to a shore as we climbed out to explore a rough trail in the rain forest. 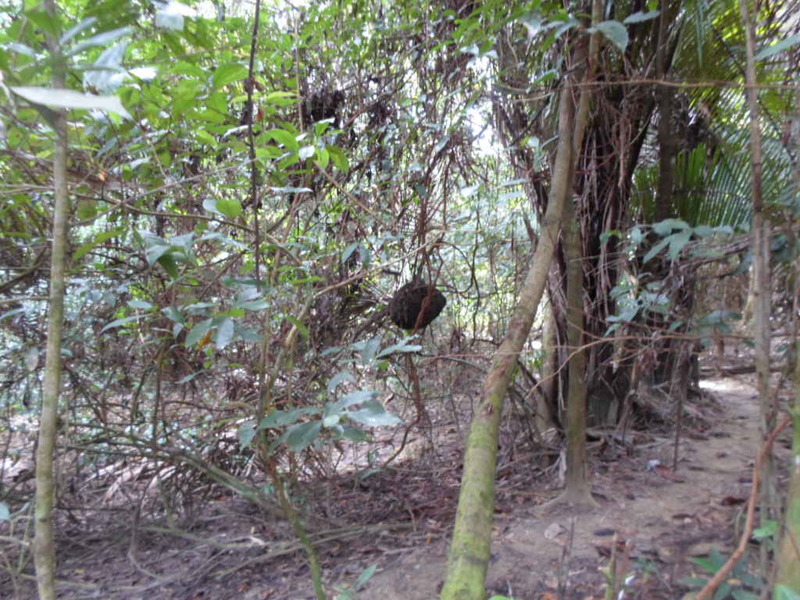 Dense vegetation along the Monkey River's edge. We lost track of the names of the endless variety of birds. Immature Blue Heron are white prior to turning blue as adults. 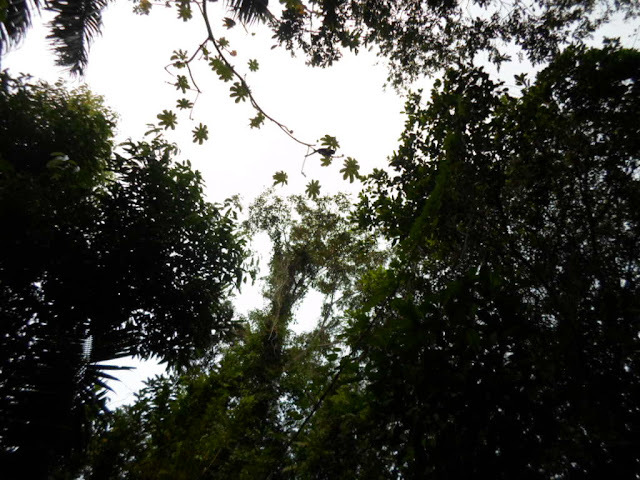 Believe it or not, there were three Black Howler Monkeys hiding in this canopy in the rain forest. We saw them move, heard them screech but so high above our heads, we couldn't focus for good shots. As soon as our feet hit dry land, Jason began banging his machete against a tree. Curiosity brought out dozens of the black monkeys high in the trees to begin of earsplitting chorus of a sound unfamiliar to our ears, both annoying and entertaining at the same time. 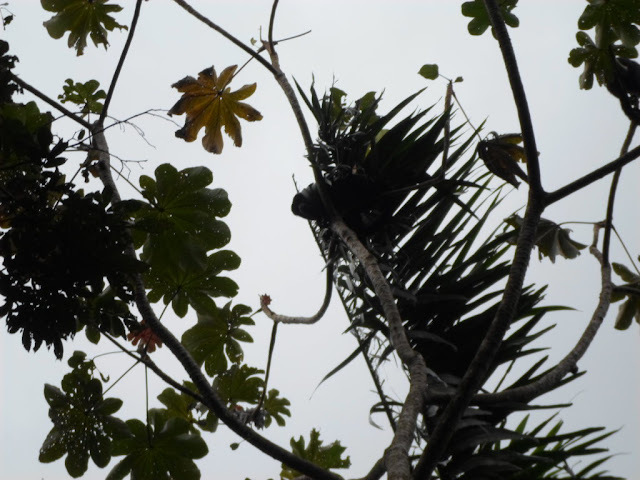 Dozens of Black Howler Monkeys hovered in these trees. 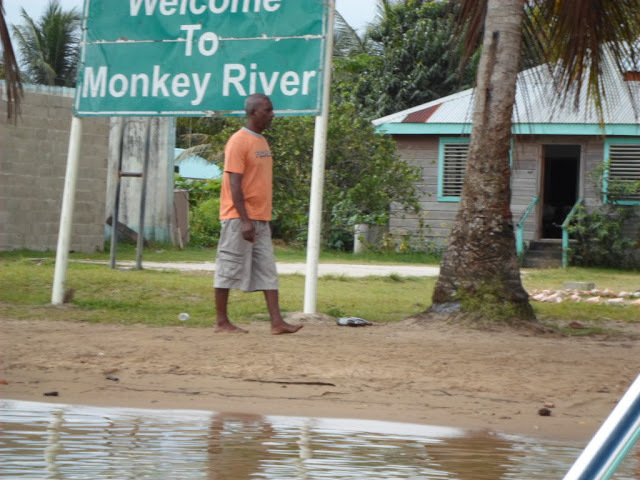 The entrance to Monkey River. Magical sounds filled the air of creatures big and small, hidden out of sight protecting their young. Over and again Jason warned us to look out for dangerous plants that were either poisonous or possessing needle like thorns difficult to remove once merely touched. 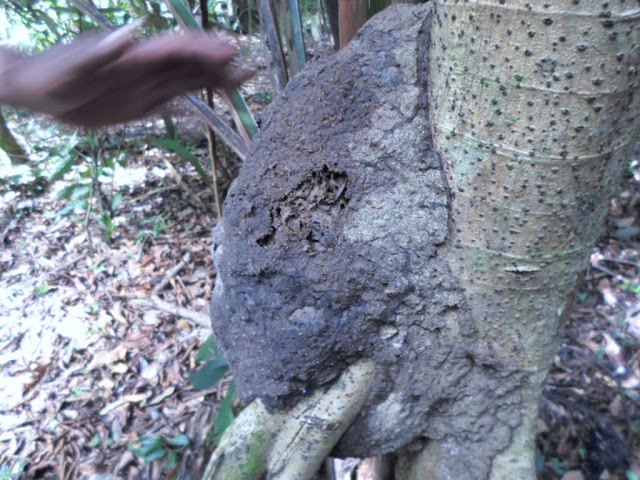 We learned about medicinal plants for almost every imaginable ailment as we carefully lifted our feet over potential pitfall from burrowed holes from hidden creatures such as the blue land crab to termite nests to the dreaded red ants meandering across the forest floor. 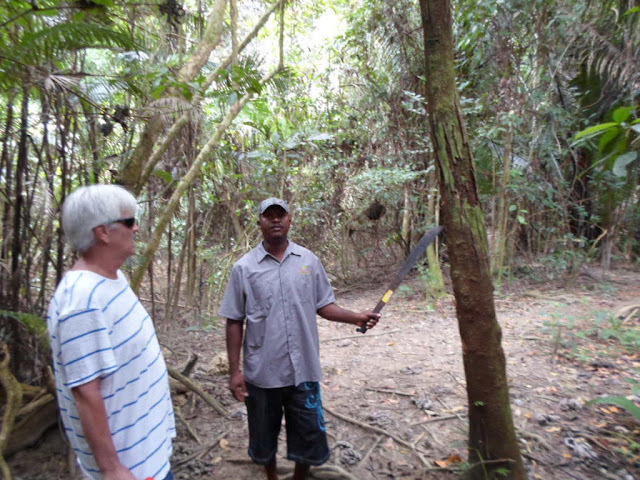 Jason, his machete and Tom as he explained the medicinal uses of this tree that the locals call "The Tourist Tree" since it relieves the sting of a sunburn. Bug spray in hand, we continually soaked ourselves, as flies, bugs and spiders presented themselves at almost every turn. 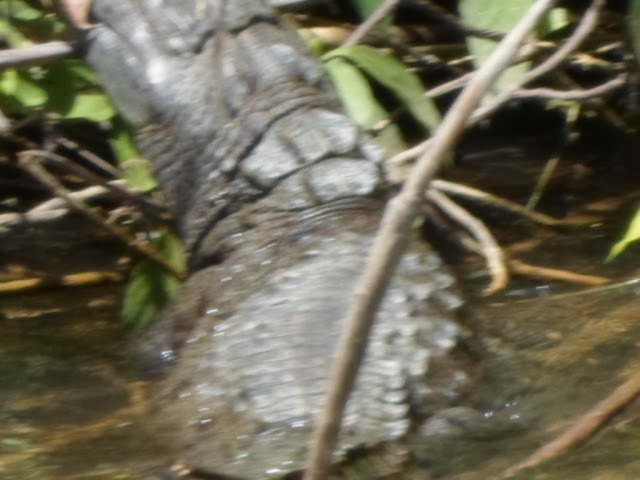 As Jason described some of the dangers in the rain forest I looked down at my water shoes and screamed a scream that must have echoes through the jungle. I thought I saw an enormous black bug on my shoe. It was a part of the laces. We laughed after we all calmed down from my senseless scream. See the photo below. ﻿﻿I can tell that Tom's chomping at the bit as I write this! Its time for me to shower and get ready to go to our now usual Tuesday night Mexican buffet at Habanero's Restaurant across and down the road. I'm hungry too looking forward to their wide array of meats, veggies and cheeses that I can enjoy along with the best guacamole in the world. 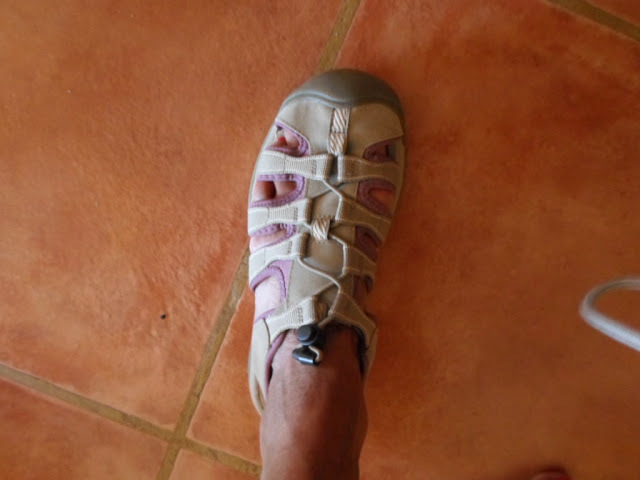 "worn for the first time" water shoes thinking that this black clasp was a huge black bug. I screamed scaring the daylight out of the five of us in our group. Tomorrow is my 65th birthday. After grocery shopping for which Estevan will pick us up promptly at 9:00 am come celebrate with us, my first birthday on our worldwide journey, as we tell the "rest of this story" with lots more photos and stories about our day trip to Monkey River. 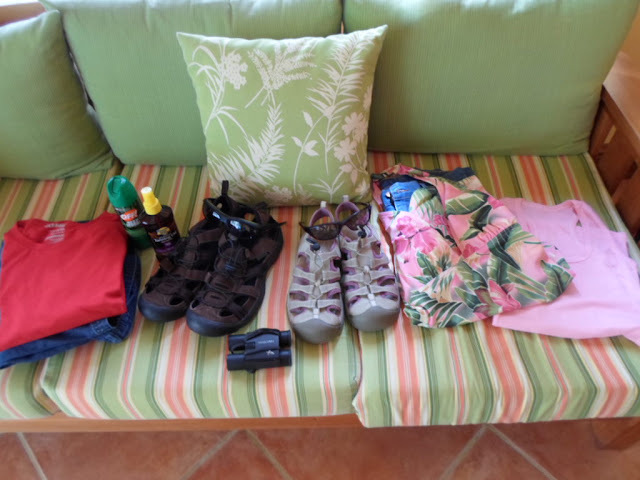 Our water shoes, Swarovski binoculars, sunglasses, shorts, bathing suits, tee shirts, sunscreen and of course, bug spray and the camera. Tomorrow morning at 7:45 we'll be taking off for an expedition, subject to good weather. Upon returning later in the day, we'll describe our experience and hopefully post many photos. Above is a photo of the "stuff" we plan to wear and bring along. We'll take photos of us, before, after, and during our greatly anticipated exploration. No, we won't be bungee jumping or, much to my dismay, zip lining. My hope, at the time we booked our travels was to experience the zip line. As we've treasured the opportunity to travel the world, we 've recently made a decision to avoid potentially injurious situations. Let's face it, on Wednesday this week, I'll turn 65. Tom, who doesn't exercise, other than walking vigorously (as of late) is 60. 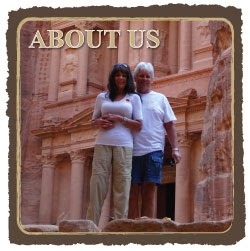 Yeah, we know, travelers older than us take monumental risks. That's not us. Although, throughout the world, we're definitely exposed to many risks traveling in certain lands. View from beach outside our veranda of Robert's Grove pier bar. Not athletic but generally fit and now in good health, no experience is worth risking damage to my delicate spine. After being totally pain free for over 18 months based on the benefits of my strict anti-inflammation diet, we've decided that no adventure is worth ruining the remainder of the world travels awaiting us. Without a doubt, now that we're settled, relaxed and... our 2012 prep spreadsheet is in the hands of our accountant (as of this morning), we're anxious to venture out to further explore the amazing country of Belize, learning about it's people, wildlife, geography, vegetation and history, all of which we'll share here. The past few days the weather's been unpredictable with a combination of high winds, fast moving clouds and some drizzles resulting in rough seas. Yesterday, we avoided our usual lengthy walk along the beach. It was cold! Tom laughed at me shivering in 70 degrees but, after days of 86 degrees with 80% or more humidity, it felt chilly. Windy and cloudy on the beach today. This afternoon, the clouds moved out. Minutes later we were ensconced in our favorite lawn chairs, our phones loaded with multiple books on Kindle apps, in order to lazily lounge for our usual one-hour of sun worshipping ending with a dunk in the pristine unheated infinity pool. I hadn't read a novel in years, never taking the time to "get out of my head" in a novel. Instead, I read volumes of informational, educational non-fiction books. Having completed an entire mindless novel in the past few days, I felt refreshed and content to have allowed myself to relax to this degree. Tonight, we'll dine in. With a whole leftover roasted chicken, onions and carrots and homemade coleslaw (made with a tiny head of cabbage and a few giant carrots that I shredded with a knife) we'll partake in a pleasure from our past, watching the TV show, The Bachelor. Much to our surprise, in Belize, we have full access to US television shows broadcasting all major networks and cable channels from New York. Seldom watching TV since leaving the US, tonight's the night. Freshly showered, in comfy clothes, we'll soon park ourselves in front of the flat screen TV, trays on our laps, great food on our plates, doing what we love the most, simply being together. Gee...it's fun to be retired! Check back tomorrow for details of our outing. Lightening the load...all moved in...more photos! Photos and more photos tomorrow too!